Here at West Side Environmental we’re concerned about the preservation of our environment and the proper disposal of materials. Basically, we think recycling is really trendy. Who cares what Rihanna wore to the MET Gala? If it wasn’t recycled plastic bottles and cardboard TP rolls, we’re really not that interested. So while it might be a while before the likes of Rihanna thinks recycled clothing is the new black, we hope that these recycling trends will inspire you to make a difference in the way you dispose of your waste. Here’s a quick look at the freshest ways the leaders in the waste and recycling industry are staying green. 1. Most companies in our industry are embracing the change from diesel fuel to compressed natural gas (CNG). 10% of all waste and recycling truck fleets have made the big switch in order to reduce their carbon footprint. 2. Big cities are creating more aggressive waste agendas. For example, New York City just signed a 20-year agreement with Covanta to convert the city’s municipal solid waste (MSW) into clean, reusable energy. 3. Dealing with coal ash is another new trend in the recycling industry. Coal ash is formed when coal is burned to create steam for power generation. Approximately 45% of all coal ash is reused. 4. Extended Producer Responsibility laws are gaining ground in certain areas of the country. These are the laws that pertain to the disposal of more hazardous materials like batteries. 5. Financial performance is increasing for recycling companies. This means that the population is becoming more environmentally aware and recycling more. 6. Mergers and acquisitions of multiple recycling and waste companies are a large trend in the industry. 7. More and more states are now embracing recycling goals. 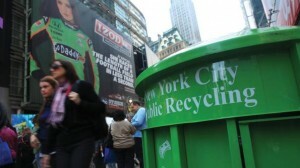 Comprehensive recycling plans are a growing trend. 8. Lastly, States are banning food waste from landfills and adopting organics recycling. This entry was posted in Going Green, Recycle, recycling, Trucking, Waste and tagged going green, Recycled aggregate, recycling, Waste. Bookmark the permalink.